There’s this feel an Arsenal fan gets when they see the magnificent Emirates Stadium every season. The magnificent arena with a great fanbase cheering the lads up to do better. After the long-standing trophy drought, Arsenal has won two FA Cups in their new home ground and the fans would be wishing for more. The Emirates Cup is a decent competition that offers the fans to watch their team play against Europe’s finest and down the years, some great teams have featured in the tournament. As fate may have it, there are also times when an ex-Gunner gets to visit the home ground of a place he once called home and depending on his departure from the club, the reception the player gets varies. Take Mathieu Flamini for instance, that departed acrimoniously because he wanted some extra coins of silver. When he played for AC Milan in the 2010 edition of the tournament, his every touch was met with jeers and boos from the crowd. Two years later, King Thierry Henry and his New York Red Bulls visited the home of football and as you’d expect from his adoring fans, he was treated like the King he is. Yesterday, the egotistical and cocky Lord Nicklas Bendtner led the line as VFL Bendtner Wolfsburg lost to Villarreal but the fans seemed to be happy with the Lord and his every touch was greeted with a cheer. The fans welcomed their heroes for the first time at home and when I saw the lineup, I expected a good game of football. What I witnessed was an awesome game of football. Arsene Wenger did ever so well to find a balanced side as the lads continue to build their fitness for the forthcoming campaign. While I expected to see the experienced heads on the pitch, the likes of Alex Iwobi and Emiliano Martinez offered a different dynamism to the team. Lyon actually drew first blood when Njie fired a shot straight at Martinez after receiving a neat flick from Alexandre Lacazette. There were some injury concerns as the game progressed – some bloke called Lindsay Rose used his knee to smash Le Coq at the back but Clement Grenier pulled his hamstring after attempting a simple pass, much to his disappointment as the look on his face showed that he was in great discomfort. After that early spell came the blitz! Arsenal smashed in four goals in eight minutes and I was absolutely stunned with the breathtaking football on display. The first was rather routine – Mesut Ozil swinging in one of his superb dead balls that was headed shouldered home by Olivier Giroud. Following his struggles in the Everton game, as well as the club’s links with Karim Benzema, I was hoping for Arsenal’s alpha dog in attack to come up with the goods and its always nice when you see your main striker opening the scoring. 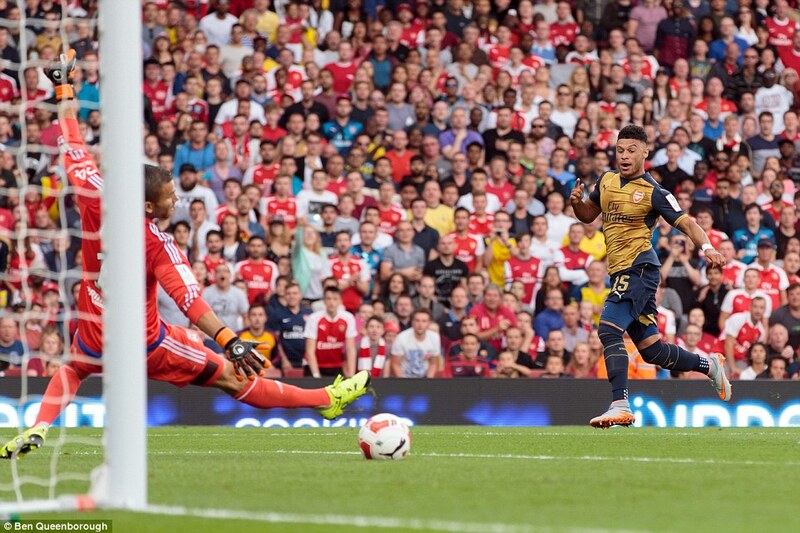 The second goal came from the exciting Ox. Wenger was hoping that the lad adds some end product to his game and I’m sure the manager was very pleased to see the Ox get on the scoring act. After latching onto a brilliant pass from Aaron Ramsey, the Ox guided the ball to the goalkeeper’s far post to make it two. A minute later, some intricate passing play saw Ozil and Ramsey combine before Iwobi smashed the ball into the back of the net. 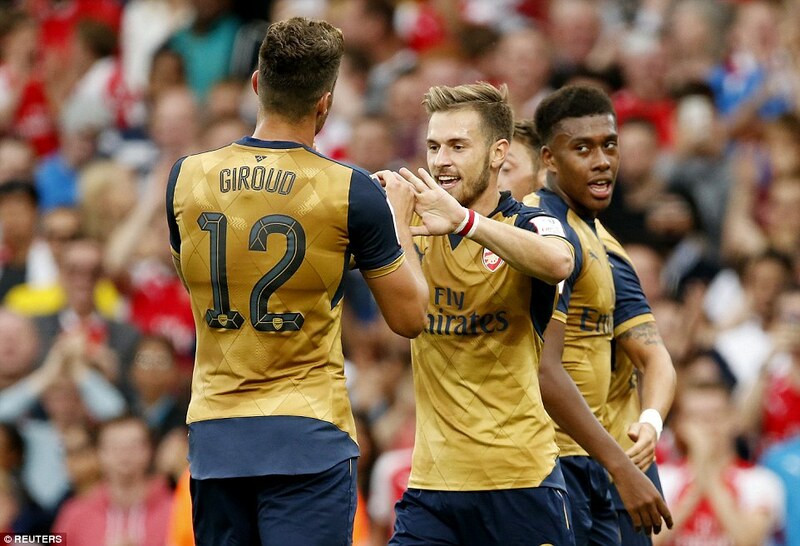 That was his first goal for the club, albeit non-competitive but the lad expressed his delight after the game. Iwobi even scored a second of the day but the offside flag denied him. 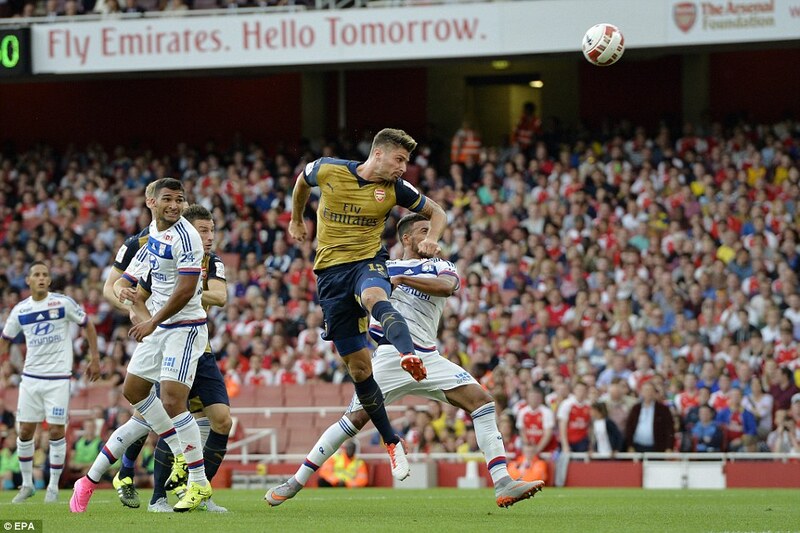 Ramsey’s fourth goal was another living proof that Ozil is such a fantastic footballer. The German schemer dallied on the ball and waited for Rambo to make a darting run before executing one of his orgasmic passes to the Welshman. 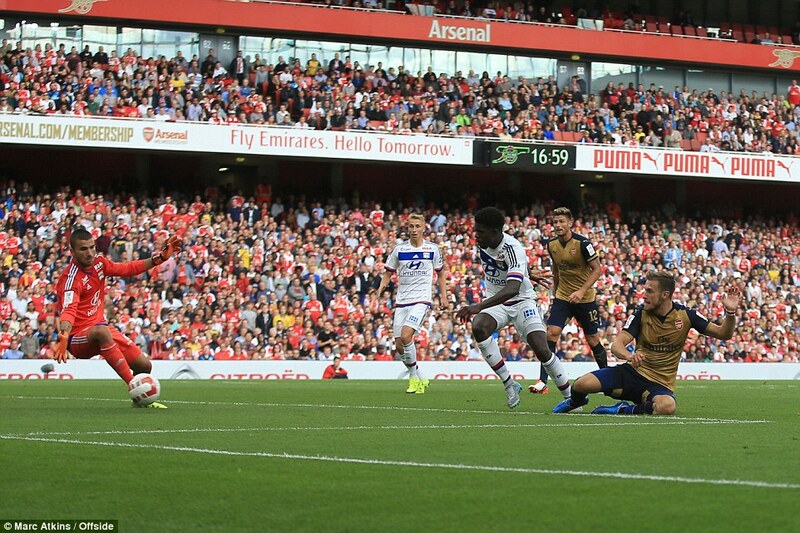 Ramsey obliged and gave the finish the buildup deserved. Arsenal took their foot off the pedal in the second half but there was still time for Ozil to get the goal his game deserved and the cake received some icing when Santi Cazorla used his left foot to guide a free kick under the wall to make it six. For a team playing Champions League football this season with Arsenal, Lyon was absolutely demolished and I wouldn’t want to be in their dressing room, even though it’s a pre-season encounter. The manager stated that the entire squad had the responsibility to add more goals to their team and he must be very excited with having six different goalscorers in yesterday’s game. It was an awesome game of football as I said earlier and I’m obviously looking forward to today’s action against Lord Bendtner and Wolfsburg. Posted on July 26, 2015, in Arsenal, Football, Match Report, Player Ratings and tagged Arsenal, Football, Lyon, Player Ratings. Bookmark the permalink. Leave a comment.